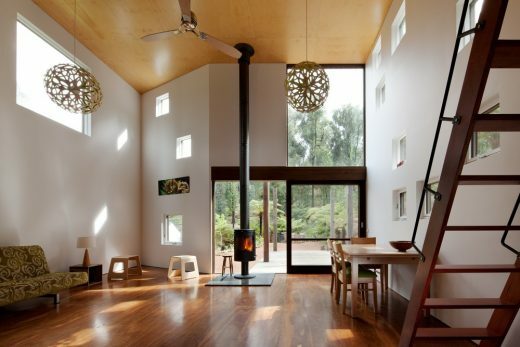 The project, a weekender for a Melbourne based family of 3, encompasses re-building and re-inhabitation post the 2009 Black Saturday mega fires, which decimated Marysville. It is a 60 sqm double height (with sleeping mezzanine) ‘container’ with 62 sqm deck on 5588 sqm of land. The site, a steeply sloping site, backs onto the nearby state forest and overlooks the town. The building is sited on the existing terrace where the previous house stood though re-oriented. 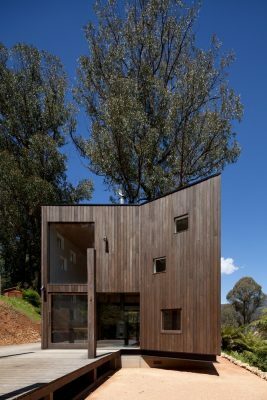 The project negotiates the issues of building in response to fire risk, notions of the bush shack and urban sensibilities of dwelling, sustainability and comfort, and crafting a series of overlapping inside and outside spaces that bring the occupants into frequent, surprising and delightful encounters with the unique phenomena and texture of its bush setting. Notions of resilience, impermanence (and most interestingly the points of resistance and tensions therein) , adaptability, reciprocity, economy and beauty were central to the design process. vi. reinforce the opportunities to live fluidly between inside and outside (given the compact amount of actual living space). c.	The house is sited on the southern end of the existing terrace, where the previous house was located. The siting has been determined by a series of interdependant considerations. It is the optimum location for maximizing northern solar access, which is very limited because of the orientation of the site, the fact of the Mountain Ash above the site on the crest of the ridge which blocks much of the winter sun, and the endless clouded over winter days. It is the location which most minimizes the potential from any future fire hazard from the range of fire risk scenarios which had to be negotiated. 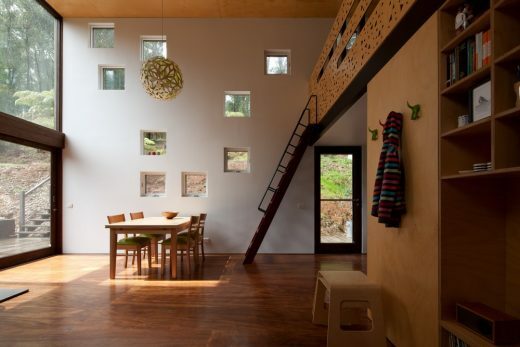 It allows the best connection between the two terraces cut into the slope of the site and the house so as to live across those overlapping spaces as much as possible. And it is located to take best advantage of the series of views and outlooks. a. The original brief asked for a larger much more conventional replacement ‘house’. 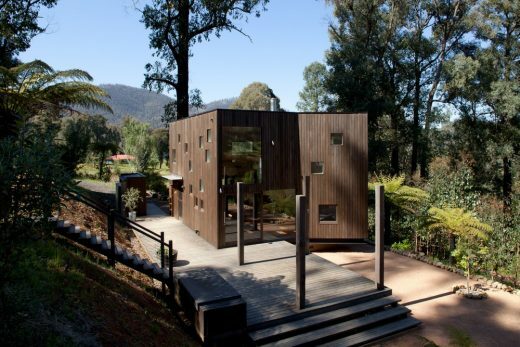 Across a period of 12 months immediately post the bushfires the perceived need to replace like with like gave way to the notion of something more emblematic of the bush retreat – a resilient, stripped back and compact container: a timber box in the forest resonant of the original settler shacks in dialogue (not always reconciled) with urban tree change sensibilities and the refinements that that insists on; a space that ‘houses’ more simply and fluidly the range of family and friends place-centric activities that the typical weekender in the bush traditionally has aspired to; a building that confronts directly the reality of building in a bush fire prone landscape without surrendering to exclsuively defensive responses, and which accomodates ideas of impermanance. b. A double height volume comprised of a main living area with kitchen and bathroom beneath a sleeping mezzanine at the rear. A separate laundry and storage ‘box’ is integrated into the southern boardwalk external to the house. The volume of the house sits on a fully enclosed double block sub-floor base and is locked into a series of decks, which connect the north of the site to the south, the upper terrace where you arrive by vehicle to the lower terrace on which the house is situated, and extend the available living space. The 3m deep mezzanine allows the space for kids to play ‘upstairs’ to free up the main room but remain in visual connection through the balustrade screen with the adults below. The double height west wall, which has one high level opening, is used to project movies. This project was a collaborative one between myself and Steffen Welsch Architects as the design team. The builder, Camson Homes, also came onboard early in the process so as to ensure, given the complexity and unknowns of the process of re-building in a bushfire ravaged area, as much construction expertise and commitment to the project as possible. The Camson team did a superb job of guiding the project through construction, building with an especially high standard of craft and commitment to the intent of the design and the desire to start over. The building is what it is because of the craft with which the builder realised the vision for the project. The project has a pre-construction BERS energy rating of 7.5 stars. The addition of an additional ply skin to all timber framed walls during construction – for structural and additional fire-proofing reasons with obvious thermal benfits – increases the overall R value of that wall, which means that the project is more likely around the 8 star mark. 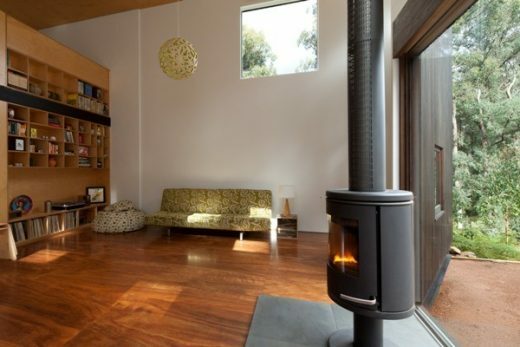 The performance across the first winter reveals that it is very comfortable with the wood heater only needing to be on a slow burn. 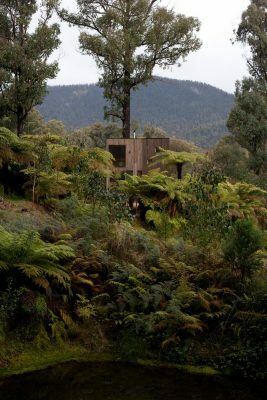 The project was an opportunity to think through some of the implications of wanting to live in bush fire prone natural landscapes. Especially interesting was the notion of the bush shack as informed by urban sensibilities – how to live in relative though stripped back comfort without importing all the flim flam of urban life and so obscuring and diminishing the point of being there in the first place. 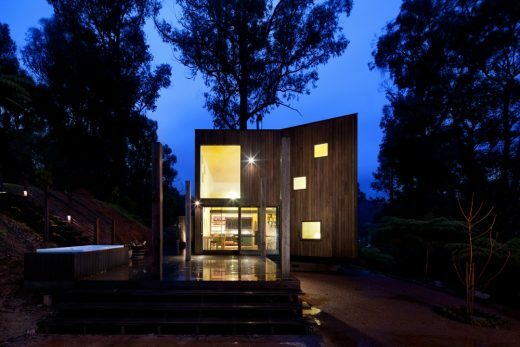 And again more broadly and critically the challenge of re-imagining the idea of house specific to the Australian interior landscape rather than continuing to import inadequate and inherently vulnerable suburban typologies.